What can we do to support Kobane? What can we do to stop ISIS? They will say just don’t get involved. They will say, we should call for “Hands Off”. They say “Hands Off Iraq”, “Hands Off Syria”. They may even tell you that there are no people who can be trusted with having arms to fight off the evil of ISIS. We the supporters of the Kurdish defenders of Kobane cannot accept any of this. We should demand that that we put out our hands out to support Kobane. We should say that there are democrats in Kurdistan in particular who are fighting and need to be supported. We should look for and make alliances elsewhere in the region – wherever we can find democrats like the forces in Kobane and Rojava. 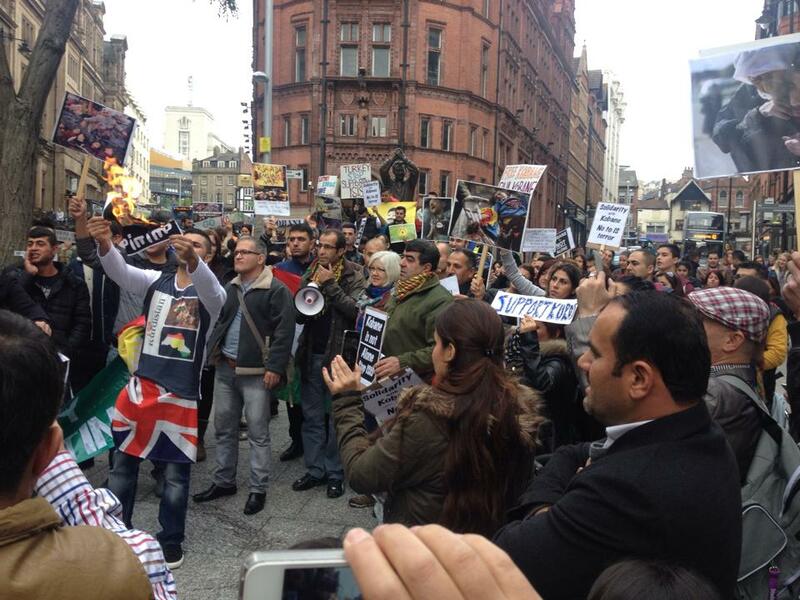 We should support those agitating in Turkey for support for the Kurdish defenders of Kobane. In the UK and US we should question and challenge the refusal of our governments to condemn Turkish complicity with the siege of Kobane. It has benefited from the chaos created by the invasion and occupation by the US and UK. During that occupation some concessions were made to the Kurdish people in the Kurdish Regional government. But the Iraq occupation allowed Maliki to foster Shia extremism. The occupation in Iraq never sought to help democrats and trade unions in Iraq. When the Arab Spring started in 2011, in Syria and elsewhere it did nothing but look for a strong leader it could support and ‘buy off’. And when it didn’t find one – it did nothing. The US (and the UK) allowed the fledging democratic revolt against Assad to face repression without offering support. And when the economic allies of the US and UK – Saudi Arabia, Qatar and Turkey – started to flood the Syrian civil war with weapons and Islamist fighters – Western governments said nothing and did even less. IS has not fallen from the sky – it does not live without money, without an ideology, without supply routes and without arms. IS has been created by the territorial ambitions of wealthy oil billionaires in Saudi Arabia, Qatar and elsewhere – it survives through alliances with powerful forces in Turkey. it is driven by the territorial and economic greed of parts of the Saudi ruling class and other ruling classes such as Qatar. After the chemical attack in Damascus a year ago – the House of Commons debated bombing Assad’s forces – but there was no proposal to back democrats in Syria or in Rojava – Western Kurdistan. Bombs alone will not defeat ISIS, just as they won’t defeat Assad. An armed democratic people will – but that was not even considered by the British parliament. Russia on the other hand have backed Assad and his brutal oppression in Syria. They did little or nothing whilst Maliki in Iraq promoted the Shi’a – Sunni divisions in Iraq. We must demand that changes. We must demand that only democrats are supported throughout the region. But if we are to do that then we must know that it is not in the nature of either the US or UK government to do that. If the US government are now bombing IS in order to relieve Kobane then that is a result of international pressure. Without that pressure they would be doing as Turkey are doing – nothing. The US is an imperialist power – the interests that determine their policy are the billionaires who profit from their relationship with Saudi Arabia and most of the other oil states. But the US also claims it is democratic and is susceptible through its people to the anger of its own people. If the siege of Kobane had only lasted a week-end and a massacre followed then they could have pretended ignorance, lack of knowledge and surprise. Erdogan would have cried ‘crocodile tears’. But after the heroic defence of Kobane by the YPG and YPJ – no-one can claim surprise at what is happening. Questions are already being asked in the US. UN special envoy to the region Staffan de Mistura has demanded that Kurdish fighters are let through the Turkish/ Syrian border and that the Kurds be armed. He has warned that if that doesn’t happen then there will be a massacre. If that happens – the US will be subjected to serious questions from democrats amongst its people. They can and should face shame and more. If you want to know why it took over 20 days for the US to give any air support to the siege of Kobane – that is your answer. Because they thought they could get away with it – but realize now that they can’t. Give arms to those who can be trusted to fight against the barbarism of IS and for democracy. Do as the democratic Kurdish fighters in Rojava want, in terms of military support – AND … ONLY do as they ask you! And we must remember that only our vigilance, our work – the work and solidarity of democrats throughout the world can ensure that Kobane is supported and IS defeated. This entry was posted in Islamism, Kurdistan, Syria, Turkey on October 11, 2014 by Pete Radcliff.